St Catherine’s Hospice is producing the biggest ever survey on end of life care in Sussex and Surrey. Shortly, you’ll receive a survey through your door to ask for your views on end of life care, whether you have received hospice care or not. Louise Lyward is a St Catherine’s community nurse caring for people in Crawley. Here she shares why it’s so important you have your say. “Every day, I have the privilege of caring for people in our community as they reach the end of their lives. My colleagues and I nurse our neighbours - the assistant in the corner shop, the refuse collectors who pick up our household waste, and the school teacher who educates our children. It’s possible we’ve even nursed some of your family and friends. We help people manage the symptoms of their illness and work with them to relieve their pain. We also make sure their family and friends have someone to talk to at what is often a very difficult time. For eight in ten local people, we provide this care in the comfort of their own homes. Homes all around you. Many people choose to be looked after at home as it’s the place they feel most comfortable. But right now, we know that we aren’t even close to reaching every person who needs us. In fact, we can currently only help one in three local people who need our expert support. We want to change this, so we’re building a new hospice in Pease Pottage to help us reach more people in our community. And to make sure that in the future nobody in East Surrey and West Sussex has to face death and loss alone. But building a new larger hospice is only part of the solution. We also need to expand our services and, to achieve that, we need to know more. We need to know what you think about end of life care in our area and what you think needs to be different. I know what it’s like when you get lots of things through the post but when you receive our survey please don’t just throw it away. Please take just 10 minutes to fill it out. Even if you need to put it aside and come back to it later. Completing our survey is vitally important because it will help us develop our services. And it will give you a unique chance, the first of its kind locally, to share with us the type of care and support you think you, your family, friends and neighbours may need from us in years to come. Whatever your experience of end of life care has been you’ll have something valuable to tell us. 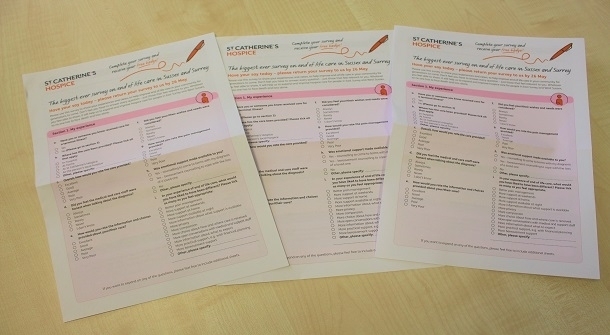 If you would like additional copies of St Catherine’s survey please contact Isabelle Taylor, Individual Giving Fundraiser at St Catherine’s, on 01293 583059 or alternatively please visit: http://bit.ly/StCatherinesHospicesurvey to fill out the survey online. Wherever possible we encourage you to fill out the postal survey.